When life conspires to keep me from my yoga practice for more than a few days, I eagerly anticipate my first morning back to the mat. I shift and shimmy and twist and turn in utter delight, nearly flinging myself into the arms of my favorite asanas. With every new pose I am reminded how happy the body feels to be stretched and swirled through its full range of motion each day. I linger in every new sensation, enjoying the resistance and then release of tight hamstrings, stuck shoulders and creaky bones. I begin to feel as if my inner doors and windows have been thrown wide open and fresh spring breezes have wafted through, carrying away weeks of cobwebs and debris. And finally, after an hour or so of practice I feel like myself again - open and spacious and at home in the world. During these happy returns, just about every yoga posture feels good. But inevitably I find myself magnetically pulled toward the deep and soul-drenching twist of marichyasana III, or Marichi's pose. 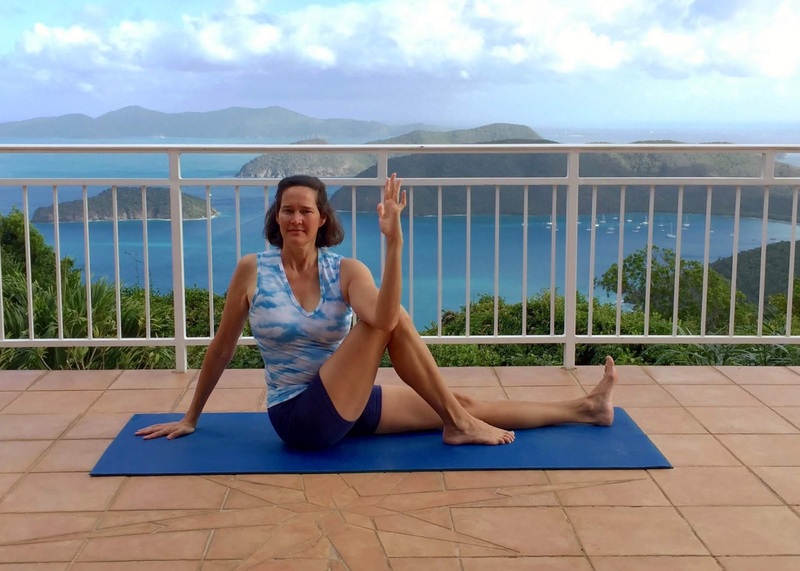 One of the most exquisite and refreshing of all yoga postures, marichyasana serves as a balm for tight shoulders, achy backs, sluggish digestion and stifled breathing. It also has a near magical ability to unclog our inner energetic pipes, leaving us balanced and rejuvenated and ready for the day ahead. To begin, sit on the edge of a folded blanket in dandasana, or staff pose, with the pelvis balanced evenly on the two sitting bones, the spine long and the legs straight. If your spine is well aligned in a neutral position, your sitting bones at the base of the pelvis will nestle into the ground, the lower back will sweep gracefully inward, the heart will be light, and the head will hover happily above your hips. If you find yourself sitting on the tailbone instead, your lower back sagging and head thrusting ahead of your shoulders, prop yourself up on a few additional blankets to help you sit firmly on the base of the pelvis. Let the legs grow long and straight, with the knees looking up toward the sky and the heels reaching enthusiastically toward the wall in front of you. At the same time, settle firmly into your sitting bones, inviting a sense of ease and spaciousness to bubble from the base or your spine all the way up through the crown of the head. Deposit little pockets of blue sky between each vertebra to augment this sense of lightness and length. These actions will help you master one of the founding principles of twists: Create length first, and then revolve out of that extension. As you breathe steadily and comfortably, climb inside your body with your mind's eye and ask yourself whether you can envision your spine within. Drop your awareness into your tailbone and then slowly, breath by breath, begin sweeping upward, through the sacrum, the waist, the upper back, the neck and finally the skull. Enjoy this process of introspection, honing your sensitivity to the feelings of life passing through you deep inside. When you’re ready to move into marichyasana, bend your right leg and place the heel on the floor next to your inner left knee. Position the right knee so that it is in line with the hip, neither waffling inward toward the opposite leg nor splaying outward toward the floor. Take care to keep the right foot parallel to the left leg. Pause for a moment and ask yourself whether in repositioning your leg you may have inadvertently shifted the hips, rounding the lower back and scrunching up the right side waist in the process. If so, recommit to length and balance in the torso by rooting down evenly through the sitting bones, nudging the lower back inward and upward, and lengthening happily through the spine. At the same time release downward through the outer right thigh to counter the tendency for the right hip to hike upward and the side waist to shorten. Remember, although you're creating asymmetry in the lower body, you still want to maintain balance and length through your core. 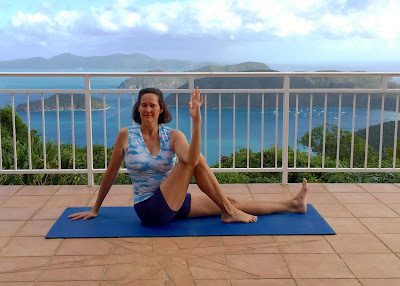 When you feel evenly settled, interlace your fingers and place your hands atop your right knee, letting your elbows hang gently at either side while the shoulder blades release toward the floor behind you. Gently settle your hands downward, letting the weight of your arms encourage your right footprint to deepen. Notice again how the downward release of energy generates a rebound effect up through your spine, encouraging each vertebra to waft brightly upward. Keep the back of the neck long by inviting the crown of your head to feel magnetically pulled toward the sky. Inhale as you elongate your spine and then exhale as you slowly spin your belly toward the bent leg. Begin the revolution deep in your body, letting the belly slip around. Let your breath guide the movement, creating length as you inhale and nudging the belly farther into the twist as you exhale. Repeat this rhythmic action several times - inhaling to lengthen and exhaling to revolve - slowly breathing your way farther around to the right without sacrificing liveliness and length in your spine. Take your time with this exploration, enjoying the many colorful sensations kindled by the spiraling of the spine. It is likely that at some point along the way you'll feel the urge to use your hands to help you deepen the stretch. When this happens, reach the right arm to the floor behind your right hip (If this causes your spine to fall backward, prop the right hand on a block). At the same time, wrap the left hand around the outer right knee, palm resting in front of the shin. Use the gentle leverage of the two hands to nudge your torso just a little farther into the twist. As you do this, anchor the right knee firmly in space so it doesn’t slip to the left as the hand presses firmly against it. This may be as far as your spine would like to twist into marichyasana for now. If, however, this action feels comfortable and your spine begs you to spiral a little farther, inhale as you lift the left arm and exhale as you place the outer left elbow at the outside of the opposite knee. Extend your left fingertips upward toward the sky with the forearm perpendicular to the floor. Inhale again to lengthen your spine and then exhale as you revolve even farther into the twist. Let the hips, heart, shoulders, neck and nose follow the graceful sweep of your spiraling spine, leading your eyes to gaze over your right shoulder. Now take a moment to reassess the situation. As you've rotated, have you unbuttoned your right sitting bone, shifting the weight of your body onto the left side of your pelvis? If so, re-root through your sitting bones and deepen the crease of your outer right hip to re-create stability at the base. Has the juice drained out of your left leg, causing it to flop sloppily toward the left? Reach firmly through the inner heel and reenergize the entire leg, turning the face of the knee up toward the ceiling. And have your lower ribs sagged toward the right arm, turning the spine into a bit of a banana? If this is the case, press the right hand firmly into the floor while gently drawing the floating ribs toward the left until the two sides of your waist feel equally long. When you’re certain that every cell in your body has recovered its graceful alignment and composure, you may decide to inhale to lengthen and exhale to revolve just a few more times, milking the twist for all its worth. Let the breath massage your abdominal organs as you do this, inviting your inner body to soften and surrender to the refreshing action of the twist. Let marichyasana wring everything that is inessential out of you. When you've had enough of this inner squeeze, slowly unravel yourself from the pose with fluidity and finesse. Enjoy the effortless release of your spine as it slips back toward neutral. Straighten your right leg into dandasana, close your eyes and observe how Marichyasana has changed you. As you rest here, enjoy the delicious feeling of being refilled with fresh, clear breath and renewed vitality. When your body signals that it is ready to move into the pose twisting to the left, repeat the same movements in the opposite direction, maintaining a quiet and receptive attitude all the while. Avoid the tendency to hustle through the second half of the pose just to check it off your to-do list. Instead, move slowly and with patience, enjoying each passing sensation and breath. Once you’ve settled into a satisfying twist on the second side, imagine a swirling ribbon of satin beautifully winding its way around your spine, and with your mind’s eye trace that silky spiral from your tailbone all the way up into the sky. Invite these inner swirls to be as even and graceful as possible so your spine feels evenly stretched from bottom to top. Fill your inner spaces with softness and tenderness, and invite all the cells of your body to surrender to the spiraling action of the twist. Imagine the breath carving out new pathways deep within your lungs, patiently working its way into long-lost nooks and crannies within. Linger here for a few last breaths before releasing slowly out of your soul-drenching twist. Stretch out your left leg and settle back into savasana, or corpse pose, for a few moments of quiet relaxation. Breathe gently, soften the inner body and enjoy the juicy vibrancy marichyasana has offered. Savor the lively, rinsed-clean freshness still swirling through you. Invite every cell in your body to be saturated by the cool, clear waters of life as they ripple through, supporting you from inside out.